Built in 1860, Villa Liberty is a beautifully traditional seven-bedroom villa just a stone's throw from Sicily's breath-taking coastline. Perfectly located up on the hill. Built in 1860, Villa Liberty is a beautifully traditional seven-bedroom villa just a stone's throw from Sicily's breath-taking coastline. Perfectly located up on the hill, the villa enjoys panoramic views over the old city of Taormina and its ancient Greco-Roman theatre, as well as the vast Ionic Sea. The interior of the villa is set on one floor, with entrance via a large hallway, with high vaulted ceilings and terracotta tiled flooring. This majestic, traditional style is furthered throughout both the living room and dining room, where one can truly sense the 150-year history of the home. Antique furniture, including many classical items, create a full character while the textures and patterns retain the local history. Both the living and dining rooms open directly onto the magnificent terraces, where you can admire the excellent views. The kitchen is fully equipped with all modern appliances to make your stay effortless. There are five bedrooms, three doubles and two singles, each individually furnished and delicately designed to reflect the history of the town and the beautiful home. The double bedroom enjoys its en-suite facilities with a shower, while the other two rooms share the main bathroom, complete with a bath and elegant hand-painted tiles. Outside, the 3000m² luxurious Mediterranean garden, with its fragrant array of bougainvillaea, pine, lemon and almond trees, creates a cooling layer around the gardens and two large terraces and ensures a private environment in which you can relax and enjoy the magnificent weather with ease. An outdoor dining area allows you to take meals in the sunshine and fresh air, under cover of refreshing foliage! Whether you're into history, architecture or culture, Taormina, the most beautiful of the ancient Sicilian cities, will ensure you are kept on your toes and entertained! Within the town, you will find endless options for drinking and dining, be that seafront restaurants, casual pavement cafes or a range of high-end bars. During the day there are plenty of fantastic shops where you can enjoy little retail therapy, including many boutique and antique shops, while late at night you will find some night-clubs playing all kinds of music for you to revel in until the early hours! Nearby you will also find scuba diving and tennis courts. Just outside the town is the magnificent park of Mount Etna, a UNESCO World Heritage Site and the highest volcano in Europe. Villa Liberty is a traditional Sicilian villa; It can accommodate up to 8 people with 5 bedrooms and 3 bathrooms. 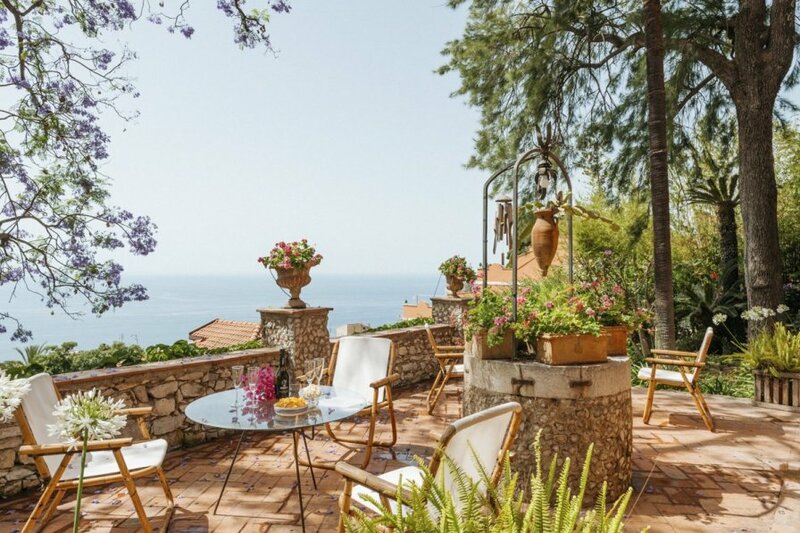 Nestled at the heart of Taormina town, on the north-eastern coast of Sicily, Villa Liberty is perfectly placed to enjoy the best of both sides of the island! Within the town, you will find endless options for drinking and dining, be that seafront restaurants, casual pavement cafes or a range of high-end bars. During the day there are plenty of fantastic shops where you can enjoy little retail therapy, including many boutique and antique shops, while late at night you will find some night-clubs playing all kinds of music for you to revel in until the early hours! Just outside the town, meanwhile, is the magnificent park of Mount Etna, a UNESCO World Heritage Site, with the highest volcano in Europe, and one of most active of the world, which is less than 40 minutes away. From June to September there are many cultural events across the town, including a film festival, theatre, classical and pop concerts, among others. A fabulously scenic path can access the many beautiful beaches along the coast, or you may opt to take the funicular down the steep hill, or you can even drive for maximum accessibility. There is a scuba diving school at Isola Bella beach, while just a ten-minute walk away you will find some great tennis courts available. Sicily is a diverse and beautiful island on the southern tip of Italy, famous for its exquisite wine and gastronomy (largely Mediterranean cuisine with strong hints of Arabic and Spanish influence), interesting architecture, and its picturesque rugged coastline. The island's capital, Palermo, has a thriving nightlife and wonderful opportunities for sightseeing.